2. 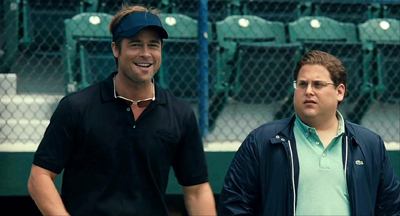 Billy Beane faces an offseason in which he loses three key players. Which of the following is not among them? 4. Billy meets Peter Brand when he visits his counterpart for which team? 7. Billy calls Pete late at night and asks him a question. After Pete answers, Billy offers him a job. What is the question Billy asks? Would you have re-signed Jason Giambi? How many wins can we get with our payroll? 12. Billy's advisers don't like Jason Giambi's brother. What is the knock on Jeremy Giambi? 13. Scott Hatteberg is clearly the single most important player in the storied history of the Oakland A's. Where does Billy visit Scott to offer him a contract? 16. In a flashback montage, we see Billy washing out through several levels of baseball. Do we see him playing for the A's? 19. Billy is irked to find a jovial atmosphere in the locker room while the team is mired in a losing streak. Which player is dancing on a chair when Billy comes in? 20. Billy trades Carlos Pena. Which of the following is not true? 22. On the game in which the A's try to set the all-time winning streak record, where is Billy when he learns that the team is up 11-0 early in the game? 23. Who do the A's play on the game in which they try to set the winning streak record? 24. Despite their remarkable late-season run, the A's season ends again with a loss in the ALDS. Who brought Oakland's season to an end in 2002?